In the wake of Super Mario 64 came a new kind of platformer. Differing from the 2D sidescrollers of the past and earlier, more linear 3D platformers such as Crash Bandicoot, Super Mario 64 ushered in a more open-world style for the genre, one that had a greater focus on collecting specific key items at the player’s own leisure, as opposed to simply making it to the end of a stage. Of all the ‘collect-a-thon’ 3D platformers that were born in Super Mario 64’s wake, there’s perhaps no more beloved example of this sub-genre than Rare’s Banjo-Kazooie. Released in 1998 – a mere two years after Mario took his revolutionary first steps into the third-dimension – Rare sought to accomplish the seemingly impossible, and beat Mario at his own game. 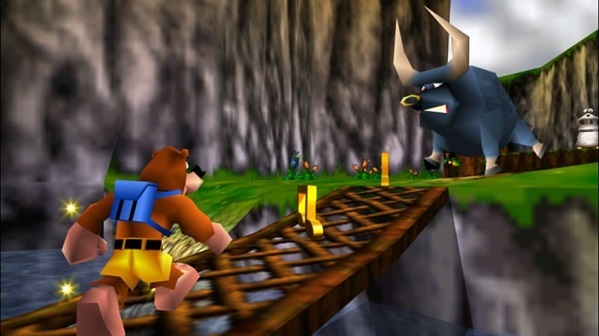 Rare’s bear and bird duo nearly pulled off that feat, delivering one of the N64’s best offerings, and one of the few games for the console that’s still a whole lot of fun to play today. In Banjo-Kazooie, players take control of the titular duo: Banjo, the lazy honey bear, and Kazooie, the sarcastic bird who lives in Banjo’s backpack. 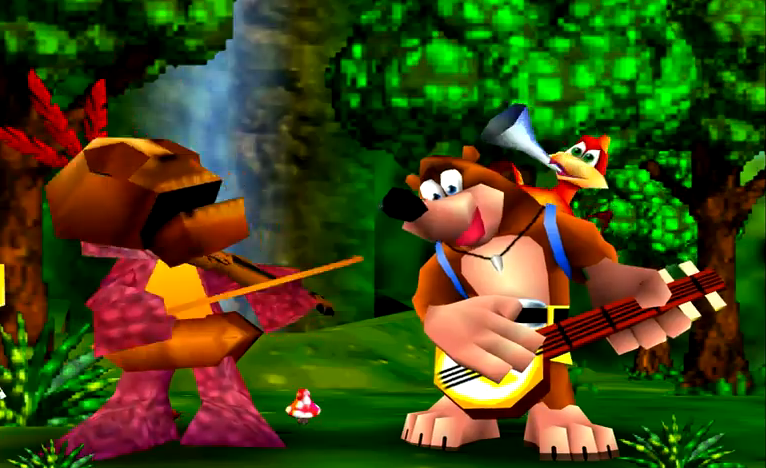 The player primarily controls Banjo for movement, with Kazooie boasting most of the special abilities. The story is simple stuff, with an evil witch named Gruntilda kidnapping Banjo’s younger sister Tooty in an attempt to steal her beauty. Unfortunately for Gruntilda, her henchman Klungo is a bit of a bungler, and his beauty-extracting machine is on the fritz, giving Banjo and Kazooie ample time to set off to Gruntilda’s Lair on a rescue mission. It’s your typical damsel in distress plot, but the game’s consistently charming characters and often hilarious dialogue make it a unique adventure. Speaking of dialogue, Banjo-Kazooie’s “garbled speech” is one of its most iconic attributes, with each character having their own distinct gibberish noises playing over dialogue instead of any kind of traditional voiceovers. Some of these “voices” may be a little irritating, but they’ve become somewhat iconic in the years since the game’s release, as they’ve added to the game’s already stellar sound work, with an unforgettable soundtrack by Grant Kirkhope that captures Banjo-Kazooie’s unique sense of charm and whimsy. In terms of gameplay, Banjo-Kazooie is incredibly similar to the Mario adventure that inspired it. After completing a tutorial in Banjo’s home of Spiral Mountain, you traverse the chambers of Gruntilda’s Lair, which serves as something of a more sinister contrast to Peach’s Castle from Super Mario 64. Golden jigsaw pieces – called “Jiggies” – serve as the equivalent of Mario’s Power Stars, and a set amount are required to unlock each of the game’s nine proper stages. Meanwhile, music notes more or less take the place of coins, but have an added usage in unlocking further chambers within Gruntilda’s Lair. Each of the stages house 10 Jiggies and 100 musical notes, while the Lair itself has an additional 10 Jiggies to collect, for a grand total of 100 Jiggies and 900 music notes. Not every collectible needs to be obtained to complete the game, however, and all of these items can be gathered at the player’s own pace. This is where Banjo-Kazooie begins to deviate away from Mario 64’s influence and becomes its own beast. While Super Mario 64’s levels were presented in a sequence of missions (with players only able to go off the path and collect alternate stars from the selected mission on occasion), Banjo-Kazooie’s stages serve as wide-open sandboxes, with players able to gather the collectibles in whatever order at almost any time. Perhaps an even bigger change to Mario’s formula is that Banjo and Kazooie progressively learn more moves throughout their adventure, provided they can find Bottles the mole hiding in one of his molehills on the first few stages. These moves range from using Kazooie’s legs to walk faster and climb steep slopes to shooting eggs from Kazooie’s mouth and rear. These moves are not only used to navigate through levels and defeat enemies, but many of them are required to find new sections of Gruntilda’s Lair and to reach specific Jiggies, giving the game a small dose of a Metroidvania element. 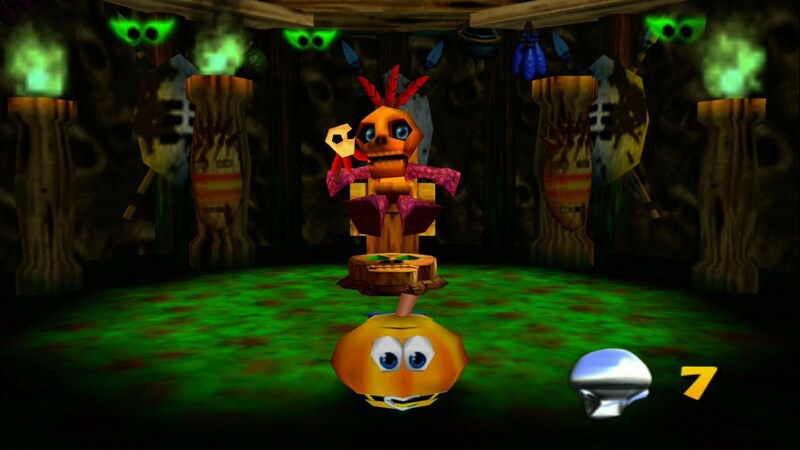 Along with Bottles, the most important side character is Mumbo Jumbo, a mystical shaman who transforms Banjo and Kazooie into a variety of forms, ranging from termites to pumpkins to bees. Just find some Mumbo Tokens and take them to Mumbo’s Hut to be able to achieve a level’s transformation at any given time. There is a downside to both the progressing moveset and transformations, however, in that both features can feel a bit underutilized. While the prospect of revisiting levels with new moves to reach previously inaccessible places and items may sound enticing, chances are you’ll find every molehill in your first go around of one level and have everything you need for the next. Only two of the levels (the snow/Christmas-themed Freezeezy Peak and the desert stage of Gobi’s Valley) are particularly interchangeable, as both are unlocked close together, and each features one Jiggie that can only be accessed with a move learned in the other. As for the transformations, you’ll only change forms in five of the nine levels. And when you do get to transform, the different transformations are more or less just used to squeeze into a particular area Banjo himself can’t reach, all to obtain a single Jiggie. The fact that such elements are present at all is a joy, as they’re a testament to the inventiveness that went into Banjo-Kazooie’s creation. 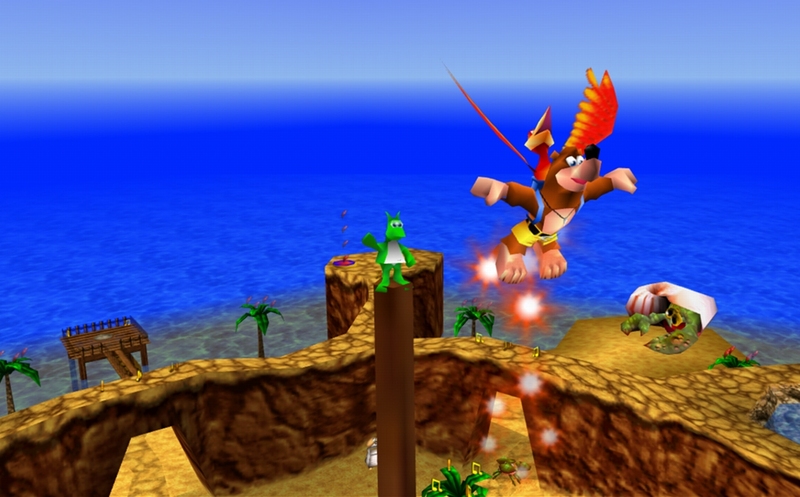 But perhaps they were ideas ahead of what Rare could handle at the time, with both concepts of revisiting levels with new moves and the transformations fulfilling much more of their potential in the game’s 2000 sequel, Banjo-Tooie. By comparison, time has shown that Banjo-Kazooie couldn’t quite reach its ambitions. If that is the case, it’s simply another testament to just how creative Rare was during Banjo-Kazooie’s development. The gameplay itself is some of the best on the Nintendo 64 and, much like Mario 64, remains a joy to play even today (though Mario 64’s sometimes clunky camera is still present). And the nine featured levels may just outdo Mario’s famed N64 outing, with some truly ingenious obstacles created to take advantage of Banjo and Kazooie’s versatile moves; and they feature themes that add new twists to platforming norms (such as the aforementioned ice world also being built around Christmas, or a sewer stage that houses a mechanical shark as its centerpiece. And Rare was wise to save their most creative level for last; a giant tree that can be visited in all four seasons of the year, with each season changing both the level’s challenges and its inhabitants). 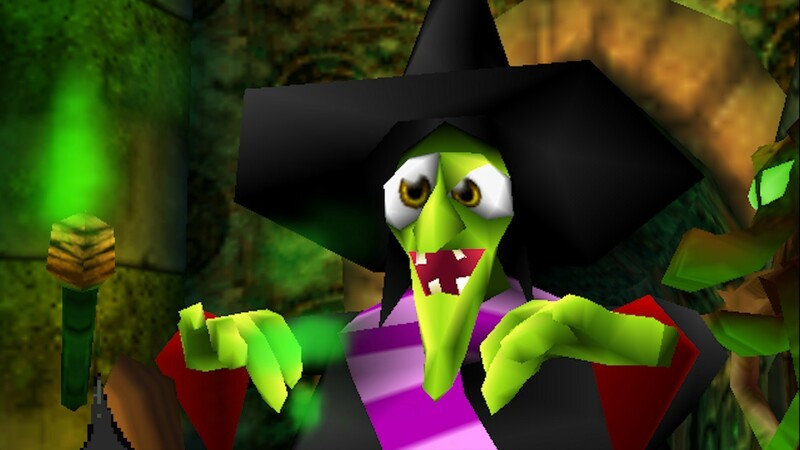 If that weren’t enough, Banjo-Kazooie’s playful spirit is perhaps most present after every level is completed, where the heroic duo take part in a quiz show/board game against the evil witch, in which players have to remember details about the game and their playthrough. Banjo-Kazooie is simply a great time from beginning to end. That so many other games from its era – including beloved titles like Goldeneye 007 – feel so outdated by today’s standards while Banjo-Kazooie still remains one of the best games in the 3D platforming genre is telling of just how much creative energy went into the game, and how well it executed it. It may not always achieve its lofty ambitions, but Banjo-Kazooie is creative, fun and charming enough to stand the test of time. TheManCalledScott of Wizard Dojo revisits one of his favorite childhood games. Does it hold up?